June 2, 2017 By Chelsea T.
Who doesn't love a good ghost story? Well, in Georgia, there's a whole lot of them! From hospitals and asylums, to cemeteries, schools, theaters, restaurants, parks, bridges, and even roads, there's an endless amount of places throughout the state that are said to have some ghostly spirits lingering. Some of these creepy spots are located in the biggest of cities that everyone knows about, and others in small towns that only locals may know of. Take a peek below to check out our Top 10 Haunted Places in the state of Georgia! This long-running American restaurant features a pirate theme and offers Southern cuisine. 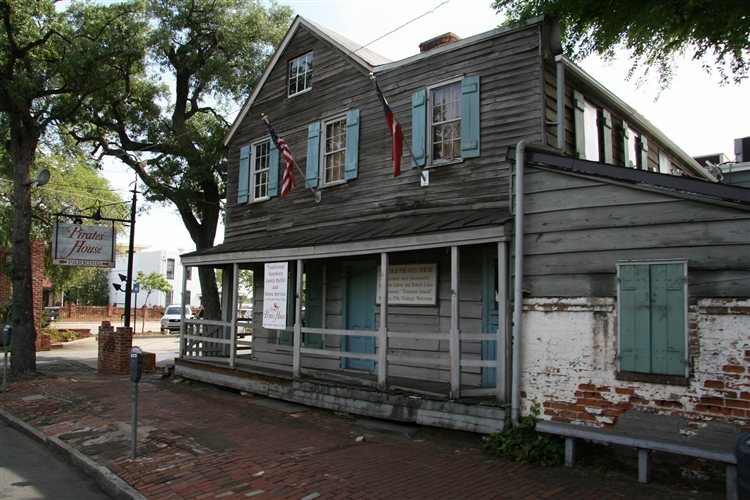 This historic location dates back to 1753 and may be the oldest standing building in all of Georgia (some sources say). A popular tourist attraction, The Pirates' House was constructed on a plot of land located on the east side of James Oglethorpe's original plan of the city of Savannah. It has 15 dining rooms, and supposedly some ghosts, too! Haunting reports at the restaurant include shadow figures and other ghostly apparitions that have been spotted walking through the dining rooms. Disembodied footsteps have also been heard, and stories say Captain Flint, from Treasure Island, died in the home and some say they've seen his ghost. 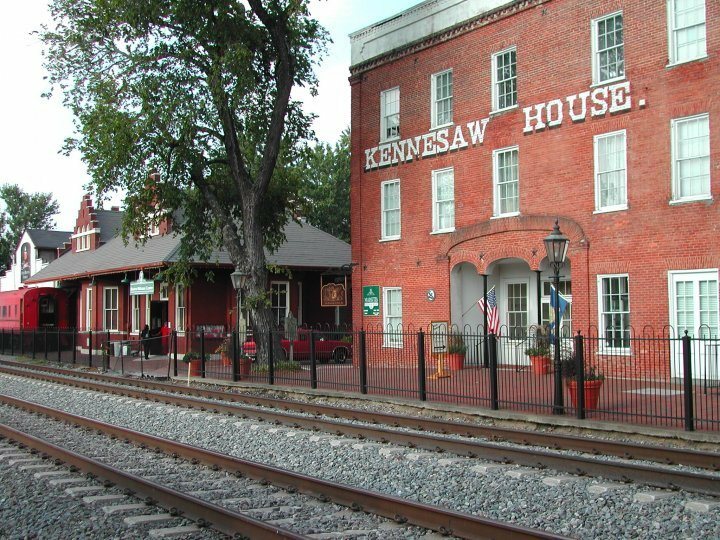 This historic, three-story building in downtown Marietta first opened its doors in 1845 and houses the Marietta Museum of History on its second and third floors. It is one of Marietta's oldest buildings and was intended to be a cotton warehouse, but was turned into the Fletcher House Hotel in 1855 after being purchased by Dix Fletcher. In 1920, the first floor of the building was renovated and transformed into small shops and then in 1979, the entire building was renovated. With this renovation, the top two floors were converted into offices, with the bottom being the Brickworks restaurant. Finally, in 1996, the Marietta Museum of History assumed occupancy of the second floor then took over the third floor after the Junior League and Southern Baseball Federation left. The home has had its fair share of paranormal activity attached to it and many, especially children, have reported seeing a lady wearing an old-fashioned dress with pink trim. Some children have identified her as the woman in a portrait in the house, Mrs. Fletcher. Paranormal investigators have explored the home and also spotted what appeared to be a ghostly figure of a woman on film. And according to Marietta.com, "The museum director, Dan Cox, has also captured several ghostly images in photos taken from the security cameras at the museum." 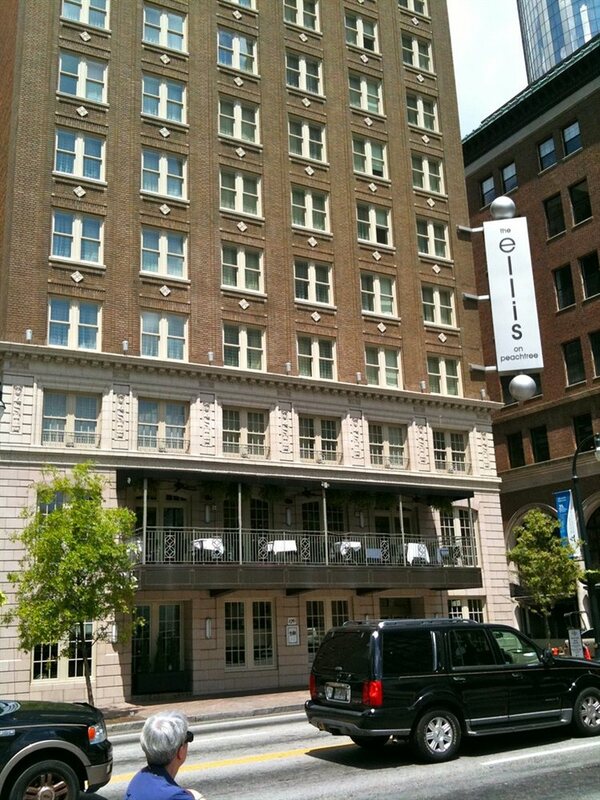 Atlanta's Ellis Hotel sits on the famed Peachtree Street and dates back to the early 1900s. Once called the Winecoff Hotel, it is the site of the most tragic hotel fire in all of U.S. history. Out of the 280 guests in the building that day, 119 of them died in the fire. Some also died trying to jump from the windows of the hotel. Many believe the hotel's hauntings stem from this event, making it quite possible that those who died here were never able to pass on to the other side. This public cemetery is located on a scenic bluff of the Wilmington River, just east of Savannah. It dates back to 1846 and was added to the National Register of Historic Places in February of 2001. 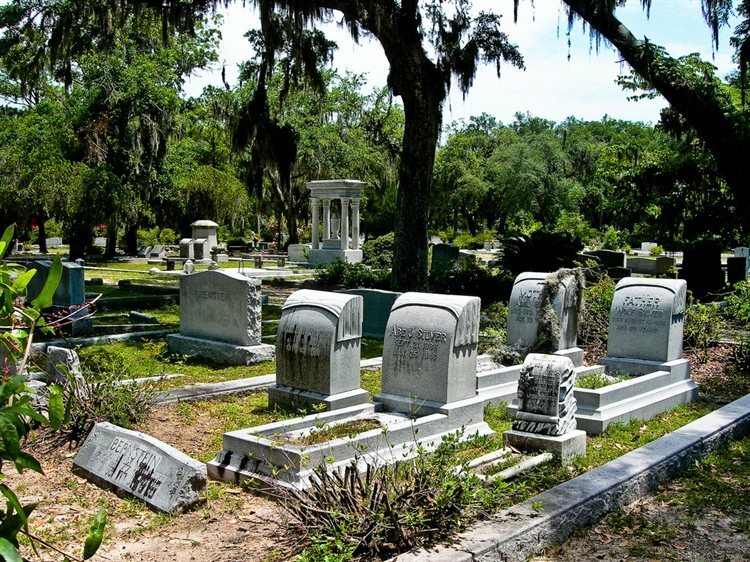 The cemetery was developed on the land of the historically significant site of Bonaventure Plantation and became famous after it was featured in John Berendt's 1994 novel, "Midnight in the Garden of Good and Evil," and in the movie directed by Clint Eastwood. It contains almost 160 acres, making it one of the largest of the city's municipal cemeteries. Known for its monuments to those who have been buried there, a common ghost tale surrounding the cemetery includes a young girl, Gracie Watson, also known as Little Gracie. She died of pneumonia and just six years old and witnesses say her statue cries tears of blood if any of her gifts are removed from her grave. Some have also spotted a girl wearing a white dress skipping through the cemetery before disappearing. According to The Line Up, other witnesses have spotted Little Gracie playing in Johnson Square, a public space near the Pulaski Hotel’s former location. 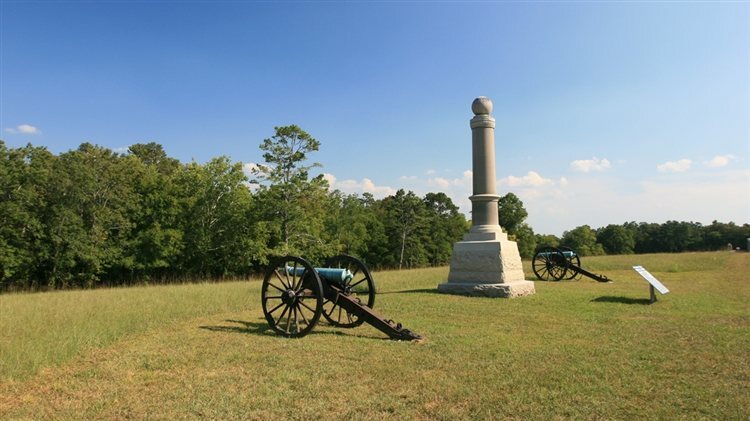 This National Park was the site of two major battles of the American Civil War: the Battle of Chickamauga and the Chattanooga Campaign. It was established in 1890 and is located in northern Georgia and eastern Tennessee. 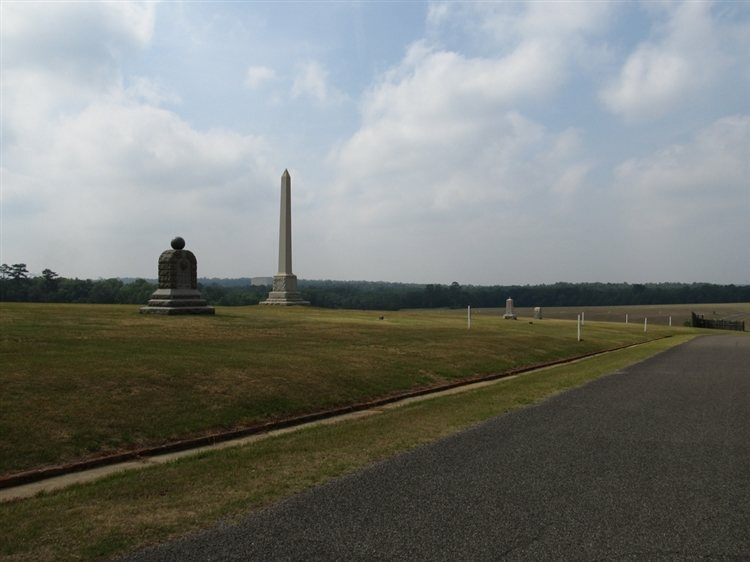 The battlefield is a wonderful place to visit, especially if you're a history buff, or into all things paranormal. Due to its past, it's no surprise that the battlefield is said to be haunted. The legendary creature that is known to linger here is known as "Ol' Green Eyes," considered to be Georgia's own Loch Ness Monster, who has appeared in two different forms. Some believe he is the ghost of a soldier whose head was blown off during battle. Others say Green Eyes is just some strange creature, half-man, half-beast. There's also The Lady in White who is said to be searching for her husband. This National Historic Site preserves the former Camp Sumter, a Confederate prisoner-of-war camp during the final year of the American Civil War. Stretched across 514 acres, it dates back to 1864 and is currently maintained by the National Park Service. It was added to the National Register of Historic Places in October of 1970. The prison was overcrowded to four times its capacity, and about 13,000 of the 45,000 Union prisoners held here ended up dying. The National Prisoner of War Museum opened in 1998 as a memorial to all American prisoners of war. It is filled with exhibits that feature art, photos, displays and videos to capture the conditions and hardships of the prison. It's also said to have some ghosts, stemming from its tragic history. Witnesses say that during the evening and at night time, unusual echoes of guns firing can be heard. Others have heard loud cries, faint whispers and whimpers, and yelling, along with extreme feelings of fear and mental devastation. 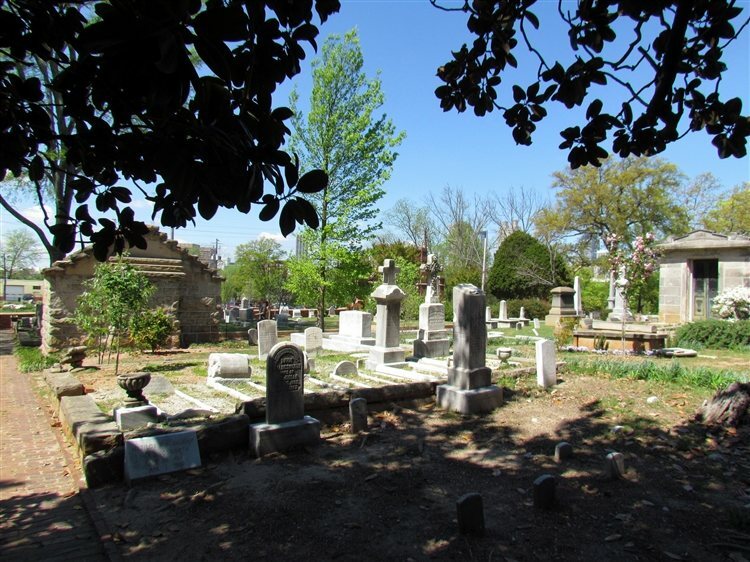 Atlanta's Oakland Cemetery is one of the largest cemeteries green spaces in the city. In 1850, the U.S. founded it as "Atlanta Cemetery" and it was renamed in 1872 to reflect the large number of oak and magnolia trees in the area. It was listed on the National Register of Historic Places in April of 1976 and is said to be a bit creepier than most cemeteries. Several areas of the cemetery are believed to be haunted, including the visitor's center, which housed the Sexton family, the first owners of the cemetery, where footsteps have been heard. According to Georgia State Signal, "Legend has it that during the month of November, one of the generals makes a roll call naming all of the soldiers buried. Since there are five generals buried in the cemetery, no one is sure which general it is, but it always occurs on the night when Sherman left Atlanta during the Battle of Atlanta." It is also said that orbs or figures appear in photos taken at the cemetery. Now known as the Central State Hospital, the state mental asylum has been Georgia's largest facility for treatment of mental illness and developmental disabilities. It sits on 21 acres of land and dates back to 1854. It was added to the National Register of Historic Places in 2005 and is believed to be one of the state's most haunted spots. Patients were often confined to rooms with other patients to try and solve the over-population issue, lobotomies took place, along with other radical forms of treatment such as insulin shock and electroshock therapy. With its tragic past, it's no surprise that many of the patients who died while residing at Central State Hospital, still lingers the place to this day. 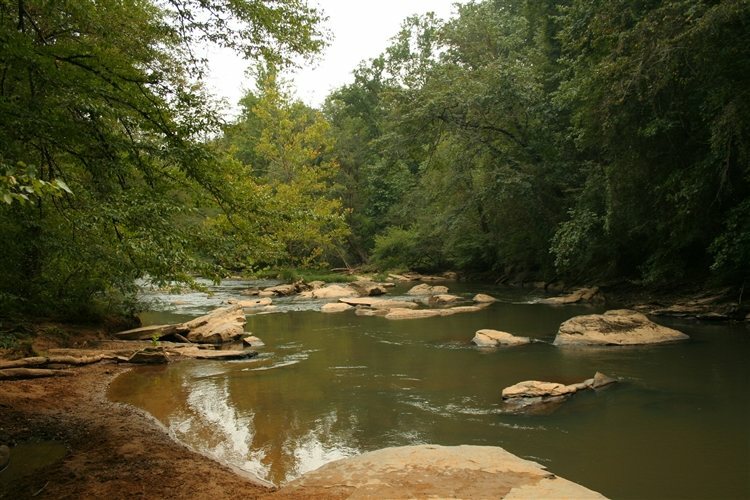 The Roswell Mill Ruins in Old Mill Park are located on the banks of Vickery Creek. Constructed in 1839 and 1853, the mills were burned by Union forces in 1864 and the 1853 mill was rebuilt after the Civil War until it was destroyed again by fire in 1926. The mills were known as the Roswell Manufacturing Company and the waterfall was created when the creek was dammed to provide water power. According to The Line Up, slaves built the mill and after a measles outbreak in 1847, many of them died. The mill still went on to be prosperous and created the wool uniforms for the Confederate Army. The site is now protected by the National Parks Service, the Roswell Mill’s violent history makes it one of Georgia’s most haunted places. Also known as the Francis Sorrel House, this historic landmark was built in 1840 and operates as a museum. It is one of the first two homes in all of Georgia to be made a State Landmark in 1954. It's also one of the largest homes in the city, sprawling 16,000 square feet. The home was first opened to the public in 1940 by the Society for the Preservation of Savannah Landmarks. Due to its haunting claims, the house has been featured on a number of shows, including "Ghost Hunters," HGTV's "If Walls Could Talk," The Travel Channel's "The Most Terrifying Places in America" and investigated by Ghost Adventures. 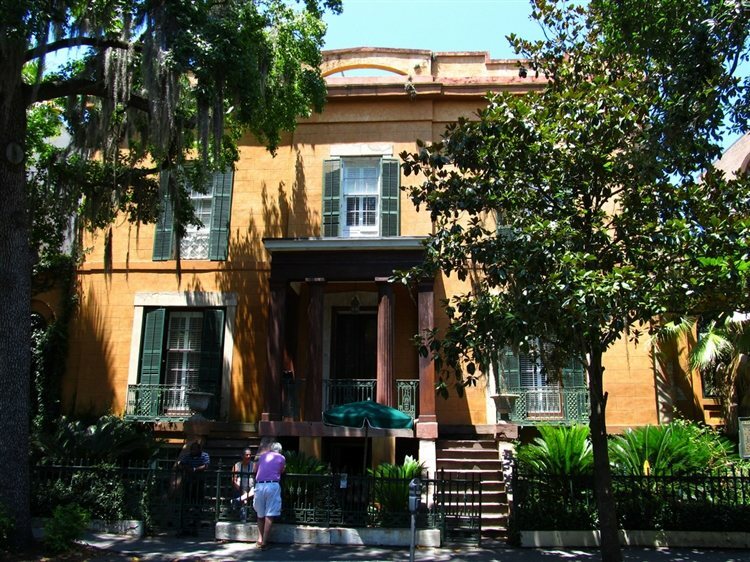 Fun fact: the opening of the 1994 film Forrest Gump was filmed from the rooftop of the Sorrel-Weed House. 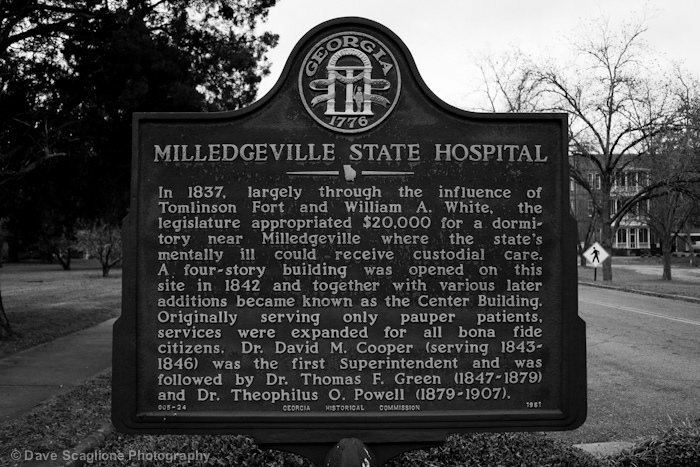 Click here to read about more Haunted Places in Georgia!